Are Kids & Teens Drinking Enough Water? 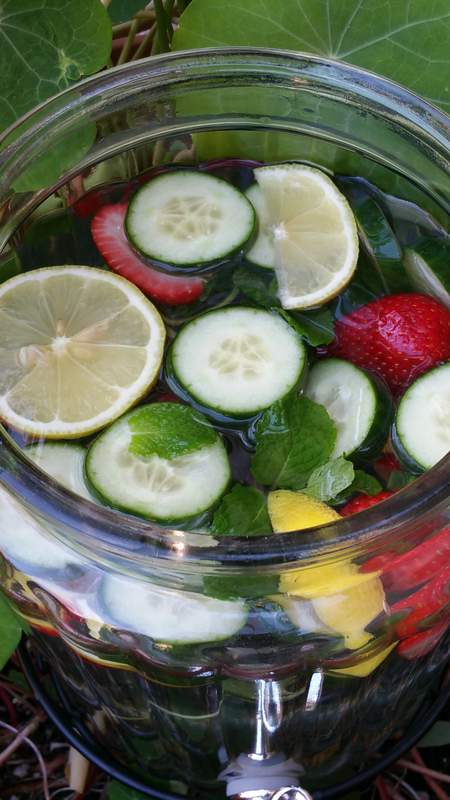 8 Tips to Help Stay Hydrated: Yummy Infused Water Recipe! | Yummy Yummy Baby! Are Kids & Teens Drinking Enough Water? 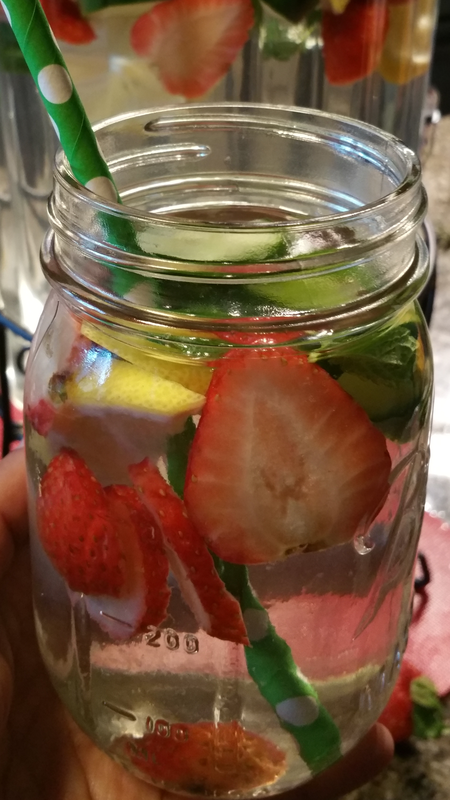 8 Tips to Help Stay Hydrated: Yummy Infused Water Recipe! Welcome back Amigos! I have a question for you, how much water do you and your kids ACTUALLY drink? As a child, I primarily drank Tea, Kool-Aid and occasional Water. I do remember adults occasionally stating the importance of water, but I didn’t take it seriously, nor did I understand how to make it a priority. Today, Nephrologists (Kidney Doctors), report that more than ever, there is a high demand for Pediatric Nephrologists (Kidney Doctor for Kids & Teens). This is due to kids being diagnosed with PAINFUL Kidney & Urinary Stones, which are often caused by a lack of water and junk food! Today, kids & teens have so many drink choices, why should they drink boring old water? Every system in our body depends on water & helps youngsters thrive! Water helps the brain function & will help detox their kidneys, liver & other vital organs. Water carries nutrients to their cells & helps them digest food. Water provides a moist environment for their ears, nose & throat systems. Water is our primary chemical component & makes up 60% of weight. How much water do kids & teens actually need? Urine is dark yellow instead of clear/light yellow. Feeling Tired & Drained even after sleeping well. Researchers have similar but varying ideas about water amount we should drink. Pay close attention to your child’s symptoms, activity level & climate you live in. Your child loses water by simply breathing, perspiring, urinating & pooping. Kids must replenish water by consuming foods & drinks that contain water. If severely dehydrated, provide real coconut water to replenish electrolytes. Speak with a health professional if dehydration symptoms persist. 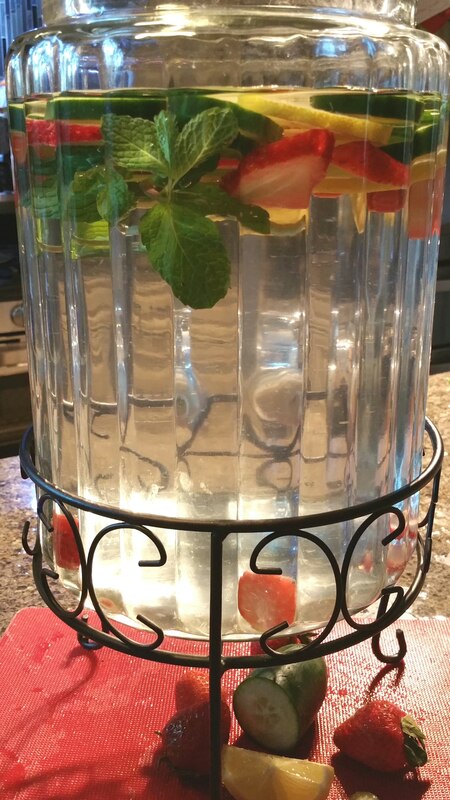 Always have clean & fresh tasting water on hand! 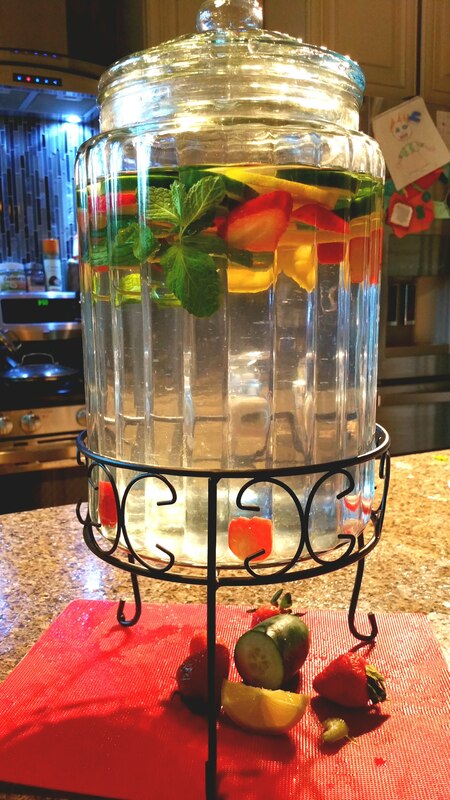 Infuse water with Organic Fruits, Veggies & Herbs! Place a 16 oz water bottle by their night stand. Have child drink 8 oz (1 cup) before sleeping. Have child drink 16 oz (2 cups) upon awakening. Model behavior so your child will watch & learn. Buy your child a sports bottle they can keep with them at all times (at school, during lunch, after recess)! The chart above may seem like a lot of water, but it really isn’t. Remember, 60% of your body is made of water, so it is critical that children’s water is replenished on a daily basis. 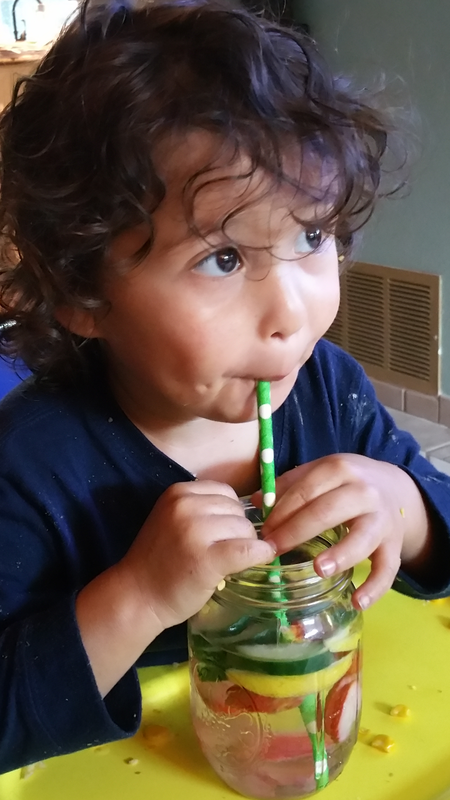 Can a child be drinking too much water? It is possible for someone to drink too much water (hyponatremia), but it is very rare, and mostly happens to people who are extreme athletes. 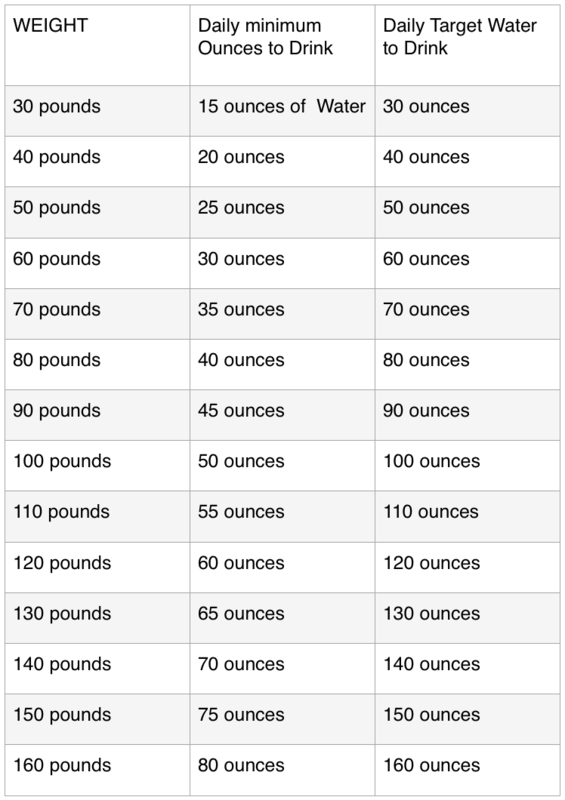 The above chart is only a guideline, it is important you adjust your kid’s water consumption if you live in a very hot/humid climate, if they are athletes or have a medical condition. 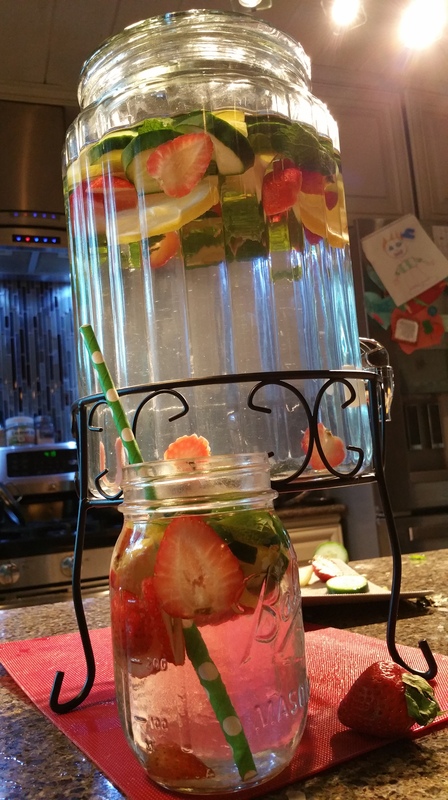 This Organic fruit & herb infused water recipe is a great way to always have great tasting water! ♥ Chill in your Fridge or Serve Room Temp. 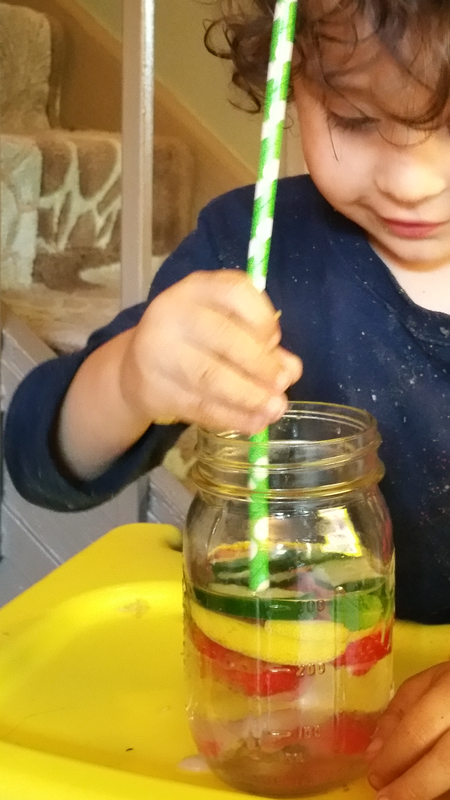 ♦ Optional: Use a wooden spoon to squash fruit at the bottom of jar before adding water. On average, food can provide about 20% of total water intake. Watermelon & Spinach are at least 90% water weight. Pregnant or breast-feeding women need additional fluids to stay hydrated. Pineapple, Orange, Ginger is another great infusion for the family. 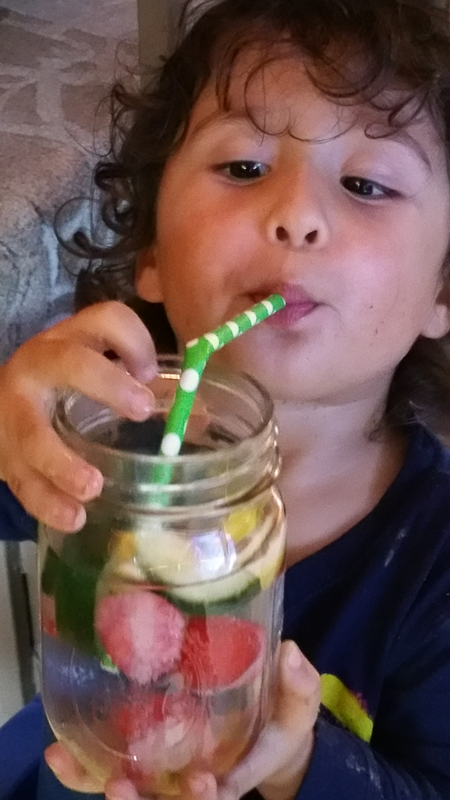 This entry was posted in Detox, FoodandDrink, Gluten Free, Healthy Living, Holistic, Infant Health, kids health, natural remedies, Raw food, Remedies, Vegan, Vegan recipe and tagged Kids Health, Pregnancy Health, Water. Bookmark the permalink. I add that children in school need to drink plenty of water during the school day. Coming in off the playground or at the end of PE class requires a healthy drink of water. Cognition, alertness depends on it. A dehydrated brain doesn’t function well. Teachers, please plan regular water breaks throughout your instructional day! Reblogged this on That's The Spirit! . Great blog post. Although it might be obvious to most, I would emphasize to only use organic fruit and herbs.